Boys who wore skirts to school in a protest have won the right to wear shorts to lessons from next year. The boys from Exeter's ISCA Academy had been told shorts were banned because they were not part of the uniform. But the school has now said "as summers are becoming hotter" shorts will be brought in as uniform next year. It said it could not allow an immediate change to uniforms because it "would put undue pressure on some of our families". More on the school skirt protest, and other stories from across Devon and Cornwall. It also said that, "recognising the recent temperatures", students were allowed not to wear their jumper or blazer. Ties were allowed to be undone and pupils were allowed to have the top button on their shirts undone and to wear their shirts untucked "if they are feeling very hot". 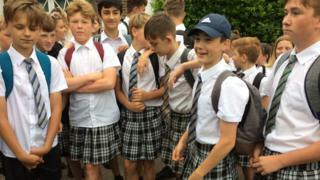 It added that none of the estimated 30 boys had been penalised for wearing skirts in the protest. The school uniform guidelines currently allow male pupils to wear trousers. Female pupils may wear trousers or tartan skirts.